The theme of Challenge 2016 is “The Radio-Philes: The Truth Is Out There,” a takeoff on the TV series “The X-Files.” For the first time, the station will be running a contest during the drive, and rewarding a dedicated listener with a grand prize of two free round-trip tickets on Alaska Airlines. To participate in "The Radio-Philes Mystery Message Contest" listeners will need to assemble the daily clues, announced at intervals throughout the drive. The complete quote and the author of the "Mystery Message" must be submitted online by the end of the drive. One winner will be selected at random from the correct submissions. Contest details can be found on the station’s website, www.hawaiipublicradio.org. Additional incentives for new and renewed membership include exclusive events such as dinner at Chef Mavro, tours of Shangri La, concerts with Kuana Torres Kahele, tickets to performing arts events around the state, and the ever-popular Hawaiian Airlines frequent flyer miles. Quantities of these thank you gifts are limited and may be available with pledges during select times only. For the complete list of gifts, see hawaiipublicradio.org/2016-gift-list. 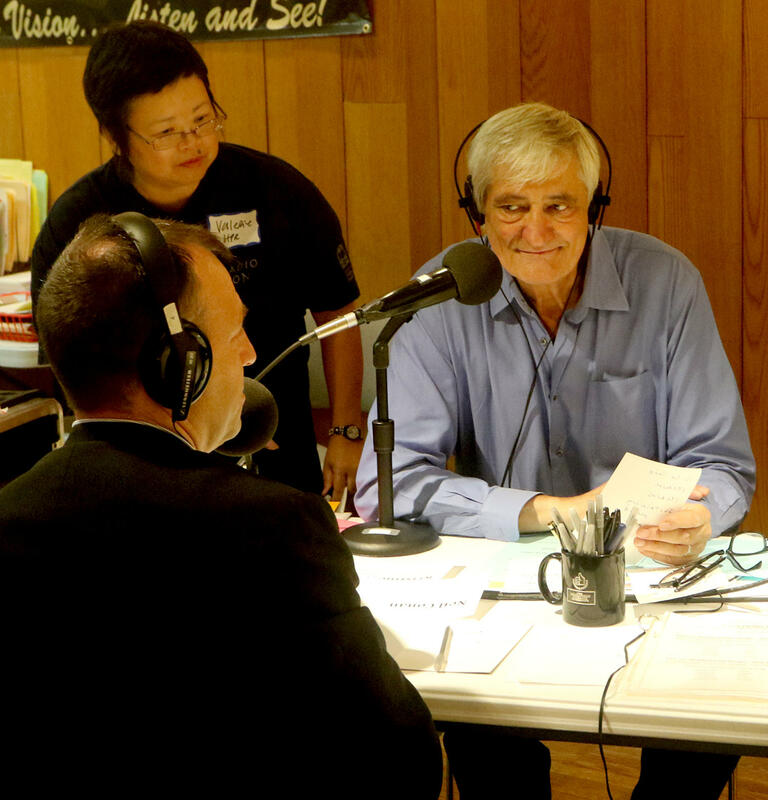 From April 6 until the conclusion of the anticipated 10-day drive, the station opens its Kāheka Street facility to approximately 150 on-air guests, spokespersons for their business or nonprofit organization, as well as more than 500 volunteers, who staff its phone banks. This year, HPR has committed to making the fund drive a “zero-waste” event. Waste management is being directed by Mindy Jaffe of Waikiki Worm Company, with recycling supplies courtesy of Lanikai School. HPR pledge table, (pictured facing camera) VP and Assistant GM Valerie Yee and President & GM Michael Titterton.